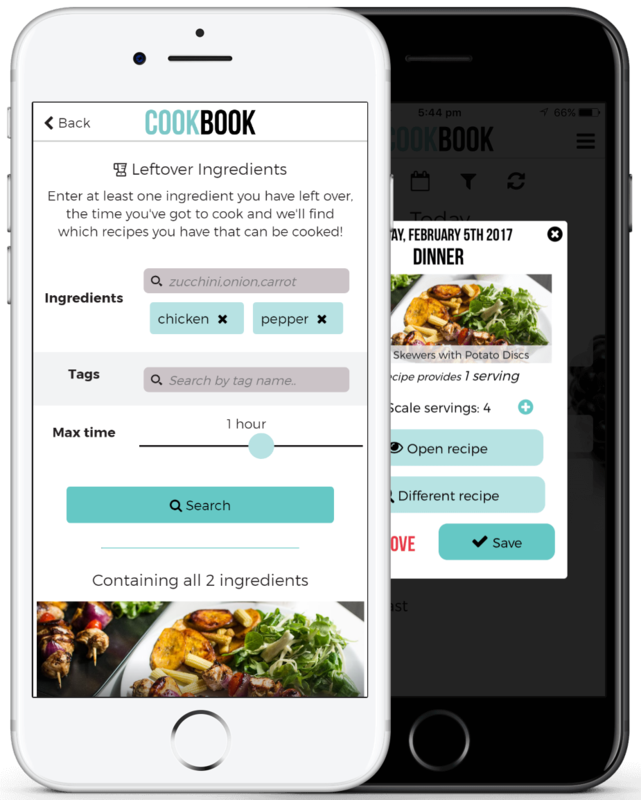 The CookBook App - Recipe Manager for iOS, Android and Online with OCR! A sleek multiplatform recipe manager, accessible on and offline, across your Apple iOS or Android devices, on your tablet, laptop or desktop. Import recipes from the web and even physical media using our free real-time recipe scanning. CookBook is your very own personal recipe organiser. Save your favourite recipes from websites, magazines, recipe books or simply those from your head, all in one place, accessible on all of your devices, anytime. Import recipes from photos using clever OCR tech! Create new or import from hundreds of sites. Stored safely in CookBook available anytime. Use CookBook on your iOS, Android and PCs. Create interactive shoppings lists from your planned meals. Plan your weekly meals and adjust the servings as required. Automatically convert ingredients to your preferred measures. Automatically detect and set timers and temperatures from steps. Are you tired of always looking for your favourite recipes in old magazine cuttings, saved website links, dusty cookery books and trying to recall that secret recipe your great grandma perfected? Well CookBook is the answer. CookBook is your very own personal, portable recipe organiser and meal planner. Scan recipes from physical books, import recipes from the web or create them from scratch, CookBook will keep them safe, making them available online and offline, across your Apple iOS or Android devices, on your tablet, laptop or desktop, under one account with no annoying adverts! We've integrated clever OCR technology into CookBook that will help you import physical recipes without the time needed to type them in! What is OCR? OCR stands for Optical Character Recognition, put simply, identifying text within images. 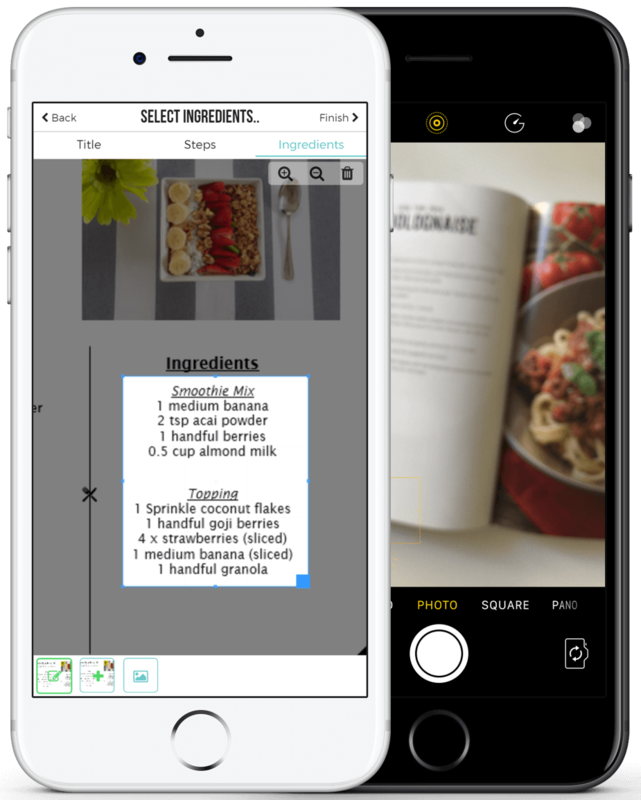 You can now take a picture of a recipe in magazines, newspapers and print outs, use our box selection tool to identify the title, steps and ingredients on the page (we find the other bits automatically for you) and our clever recipe scanner tool will convert your picture into text. Simple! Please note, you need to be connected to the internet to use this free function. The CookBook app lets you easily update or scale ingredients, share recipes with friends and family, plan your weekly meals, create shopping lists and so much more! So what are you waiting for? Download CookBook today! 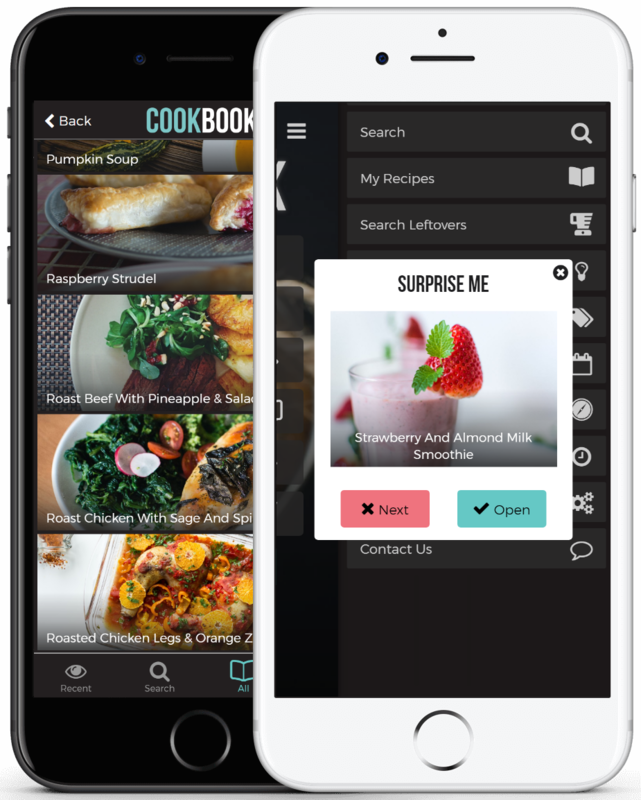 The CookBook App is designed to work seamlessly across your iOS and Android devices, in two stylish sleek designs. Your recipes and planned meals are also available to view at anytime through our website! Available on iOS, Android and your desktop and laptop. I don't ever write reviews. But this app gets an exception. I don't often pay for apps, and when I do, I expect a lot from them. This one blew my expectations out of the water. I love this app so much! This app is phenomenal. I was brainstorming features I would want in a recipe, meal, and shopping list planner app of my own creation when I came across this app. To see each idea and more come to life in a sleek, well-designed, intuitive, and powerful manner in this app was euphoric. It is better than I could have ever dreamed of! Everything I wanted and more. Amazing app, couldn't be happier with it. Does everything I need - can add recipes from websites just by copyng the link, can scan recipes from books or magazines, can scale the number of portions, plan your weekly menu, you name it. Love the layout too, especially on the tablet - it displays the list of ingredients and the steps in two columns next to each other. Just a perfect app and well worth the money. A fantastic recipe manager app which I can highly recommend and well worth the few dollars. Very flexible in the manner in which recipes can be added to your own database. I used the scan / OCR option recently for adding a recipe from a supermarket flyer and was really surprised at how intuitive the process was. Adding recipes using a web url is super easy. Searched all over for a cookbook/recipe app with great, easily editable, multi-featured recipe options. This app is that! This is the first app that I saw allowing access to recipes offline. It’s super easy to copy any recipe to this platform. Love, love, love this app. This has made my life so much easier! This is everything I ever wanted in a recipe app.  Clean, beautiful UI, excellent import tool, and just a real pleasure to use. Worth every penny. I absolutely love this app. I cook from a lot of internet recipes and was forever trying to google “pumpkin soup” and find THE pumpkin soup I made that one time that was so amazing...and it was a real pain. Then I found this app and it has changed my life! It’s like finding a magic recipe book that has all your favourite recipes in it and nothing else, and unlimited ability to add more! User experience is pretty flawless - just click a button and a recipe is imported, and neatly sliced up into ingredients and method which helps with shopping. I have never rated an app on the App Store before but I literally could not resist this time. It is the best app on my phone!! This is the best cookbook app on iOS. I have tried four of the most popular paid competitor apps and none of them compare. The auto recipe import function works amazingly well and the interface is slick and simple (the others I have used are garish) I am a coeliac and I love having the ability to store my favourite gluten free recipes on my phone. I highly recommend this app. This is beautiful, seamless and clever recipe collection app. Best one I've ever found, in appearance and functionality. This app is so user friendly. I've finally got all of my recipes in one place, and I find I actually use them now that they are all on my phone. I can get rid of all those scraps of paper! I love that I can add my own photos of each step. The timers are really great too. Have recommended to my foodie friends. Have been looking for an app to help meal plan and keep all of my family's favourite recipes in one place!